There are many directions you can take with your landscape design. One of the biggest driving forces when designing a landscape is color selection. It is important to remember that color is important because it evokes emotional responses from humans, such as calmness and/or excitement. In order to create harmony and cohesion throughout your landscape, it is imperative that you know how to choose the right blend of colors. 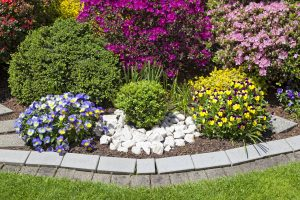 Consider the following when designing your landscape and take your curb appeal to the next level this spring season! When it comes to landscape design, neutral colors are usually in reference to various shades of white, black and gray. Neutral colors are versatile, as they can be used as the backdrop to the other bright colors you have in your landscape. Complimentary colors can be characterized as opposing colors that highlight one another when paired together. The main set of complementary colors includes blue/orange, green/red, and yellow/purple. 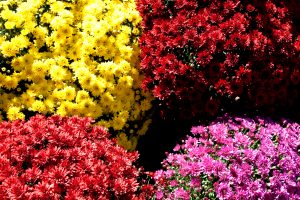 Many experienced gardeners and landscaping often use complementary colors when planting flowers. For example, if you want to accentuate your red impatiens you have clustered together in your rock garden, consider planting something green next to them. An analogous color scheme pairs similar colors together. For example, blue and violet would be considered analogous pairing. The same could be said about orange and yellow or green and blue. If you stand at a distance from an analogous color scheme, it appears as if there is just one color. If you want to achieve a harmonious effect with your landscape design, you should consider a monochromatic color scheme, which only utilizes one color, but with various shades and tints. For example, if you want to provide your property with an earthy feel, consider implementing a monochromatic color scheme that utilizes green as the base color. A riotous of color scheme uses multiple vibrant colors throughout a landscape. This type of color scheme is usually the most difficult to pull off because you still want to create cohesion and unity throughout your property. Since you are using bold colors, you want to use the same colors in multiple places so the human eye has somewhere to focus. For over 14 years, Jason Kahler and his team at JFK Lawn & Landscaping have been providing outstanding landscaping services to homeowners and businesses throughout Howard County, and recently expanded to Montgomery County and Carroll County. Family owned and operated since 2004, JFK offers services including lawn maintenance, turf enhancement, general landscaping, gutter cleaning, as well as snow removal services in the winter months. To learn more about what we do, check out our About Us page or our FAQ section. This entry was posted on Tuesday, May 1st, 2018 at 3:56 pm. Both comments and pings are currently closed.